This map shows the oldest light in our universe, as detected with the greatest precision yet by the Planck mission. 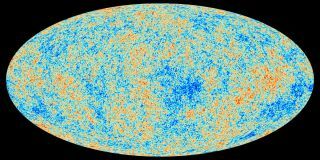 The ancient light, called the cosmic microwave background, was imprinted on the sky when the universe was 370,000 years old. It shows tiny temperature fluctuations that correspond to regions of slightly different densities, representing the seeds of all future structure: the stars and galaxies of today. Image released March 21, 2013.